The Lester River with a fresh dusting of snow. Check out the Reports section of this website for reports on Lake Superior and the St. Louis River. Coastal GIS: GIS databases of the North Shore of Lake Superior. The Lake Superior Decision Support Project: GIS-based decision support applications focused on the Lake Superior Basin. The City of Duluth is situated on a hillside next to Lake Superior, the largest freshwater lake in the world. 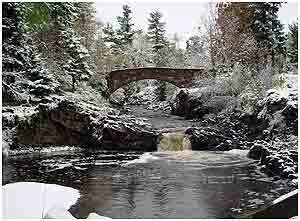 The natural environment of Duluth is unique not only because of the lake but also because of the many streams cascading over rugged terrain through vegetated corridors, all just steps away from the bustle of the city. Navigate this section with the links at the left to learn about the physical habitats found in the Duluth area. To learn more about individual streams and stream corridors visit the streams section of the website. To discover what kinds of critters spend their time in the habitats of Duluth, check out understanding organisms. Drowning & Hypothermia - Our streams and lakes can be very dangerous, especially from high flows in Spring and during storms, from rip currents on Lake Superior, and of course from thin ice in winter.